New England and Pennsylvania have long fought over the origins of these enchanting cakey, gooey, hand-held “pies”. I’m not really a fighter, more of a lover, so honestly, who cares where they came from, they are just plain ol’ delicious!! I am not a huge cake fan (but I am a frosting fan), however, these are wonderful! They draw me in with their ooey, gooey marshmallow buttercream filling, that when sandwiched between those cakey mounds, does something wonderful! My husband is from New England and he grew up feasting on these delicious treats, so I had to master these gooey “pies” and quickly. I am happy to say that these rival those from his childhood, at least that’s what he tells me. Start by measuring the hot water in a [amazon_textlink asin=’B00005RKOE’ text=’larger measuring cup’ template=’ProductLink’ store=’thefreshcoo0a-20′ marketplace=’US’ link_id=”] or bowl (big enough to allow the mixture to foam up). Add the cocoa and baking soda and mix together with fork, careful it will foam up quickly and more than you think. 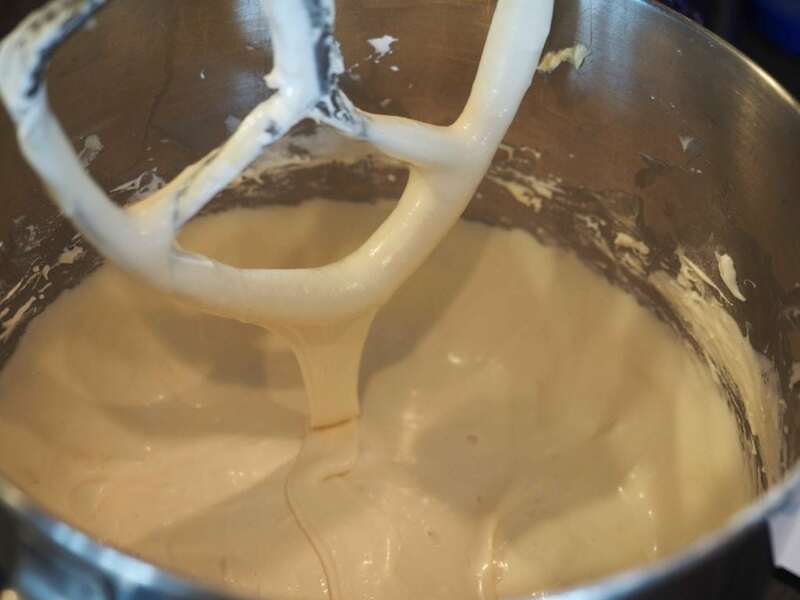 Once smooth, set aside and allow foam to settle while you prep the base of the batter. Note | Once cooled and settled you’ll add sour cream to this mixture before adding to batter. See, I wasn’t kidding how much it foams up. Here I am using a 2 cup liquid measuring cup. In a medium bowl add the all purpose flour, baking powder and salt, mix using a whisk and set aside. Next, plop your room temp butter and brown sugar into a mixing bowl, cream until it makes a nice creamy consistency, mixing about 2 minutes on medium-high. Add your egg, and vanilla and mix well, another 2 minutes on medium-high until super light and fluffy. Gently stir in ½ cup sour cream into the chocolate mixture. Slowly add half of the flour mixture on low, scraping down the sides and bottom often. Mix until combined…chocolaty yumminess! Gently mix in the rest of the flour mixture, scraping down sides, paddle and bottom often. Once thoroughly mixed into chocolate fudgy goodness. Drop using a [amazon_textlink asin=’B00004UE65′ text=’large scoop‘ template=’ProductLink’ store=’thefreshcoo0a-20′ marketplace=’US’ link_id=’940cb9cf-8b95-11e8-8d10-ab0cc5d69dc9′] (2 TBL) onto a [amazon_textlink asin=’B0762XFC5H’ text=’parchment‘ template=’ProductLink’ store=’thefreshcoo0a-20′ marketplace=’US’ link_id=’afda0918-8b95-11e8-bde6-7be2fb17218c’] lined cookie sheet. I personally like using a medium scoop. Makes a few more regular sized pies. Bake in 350° oven, 1 sheet at a time for 10-14 minutes, or until they spring back when lightly pressed in centers. If you under bake them they will be flatter and chewier, but just as good. Transfer the sheet to a wire rack and let stand until cookies firm up, 4-5 minutes. Using a spatula, transfer cookies to wire racks to cool completely. 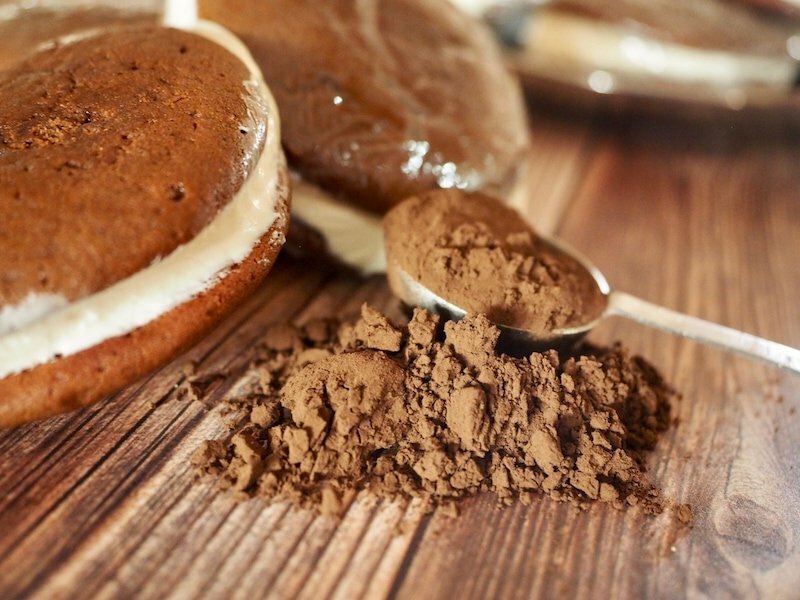 These Whoopie Pies are so worth it! At this point, the cookie/pie/cake pieces may be frozen in freezer storage bags and can be filled at a different time. I like to match them up in pairs, bottoms together, they freeze so well and pop apart easily when frozen. Layer the cookies between wax or parchment paper. 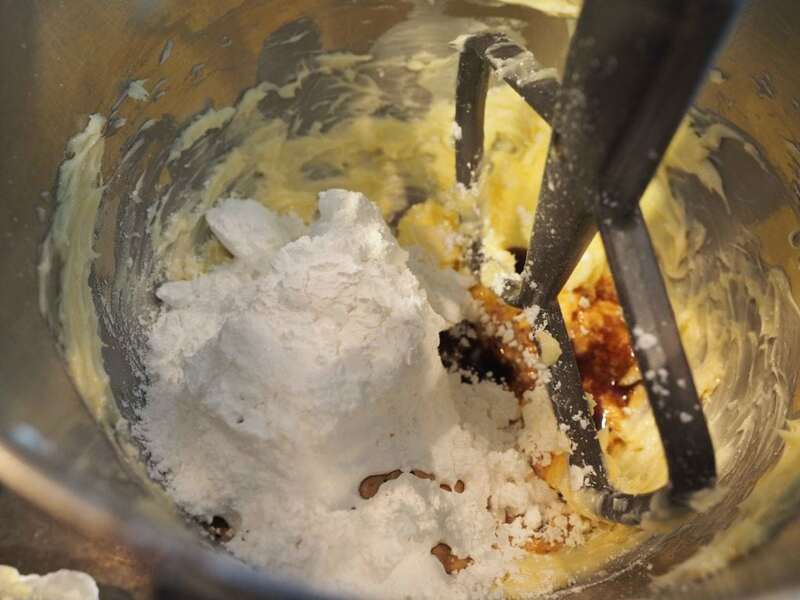 In a large bowl of an electric mixer, beat together the butter, powdered sugar, vanilla and salt until well blended and fluffy. Starting low so you don’t floof your powdered sugar all over your kitchen counter. Once blended, increase your speed to medium-high until light and fluffy. Add in marshmallow cream and beat well until evenly incorporated, it will be nicely gloopy. Is that a word? A cross between goopy and gooey and gluey, sort of, I do like to make up words. Match up the cookie tops (underside up), using a [amazon_textlink asin=’B06XNQNN99′ text=’2 TBL scoop’ template=’ProductLink’ store=’thefreshcoo0a-20′ marketplace=’US’ link_id=’1c8df284-8b96-11e8-aa68-e1ff8b0c5c94′], dollop a healthy portion of the marshmallow filling onto the bottom of the cookie, placing the top on pie, gently pressing down until fluff gets close to the edge. Wrap pies individually in plastic wrap (or sandwich baggies) and store in fridge or freezer (great to plop into a lunch box). Your friends and family will thank you! 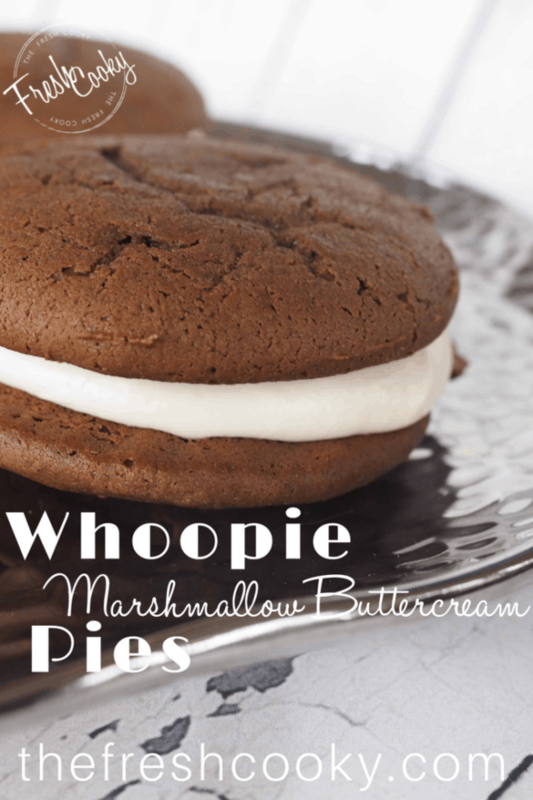 When you sink your teeth into one of these babies you will shout, “WHOOPIE”! Give this filling variation a try as well! 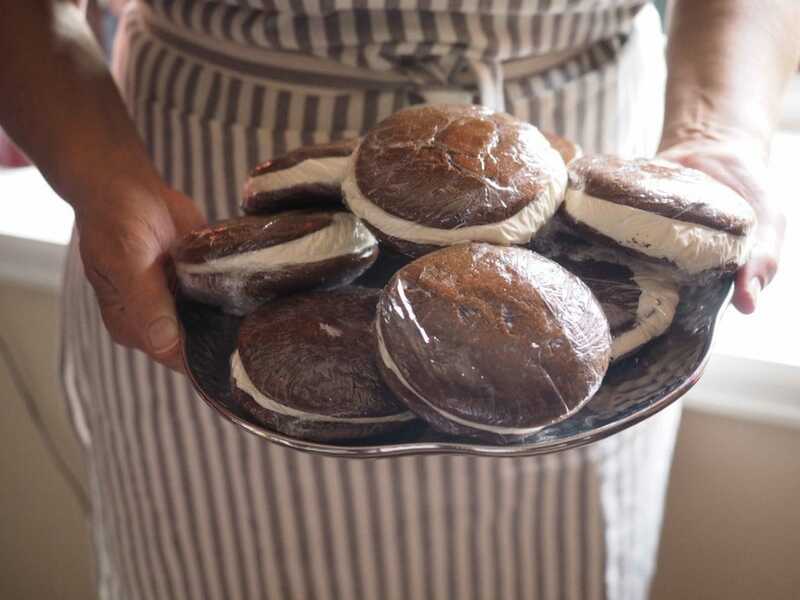 Chocolate Fluffernutter Whoopie Pies – oh my! 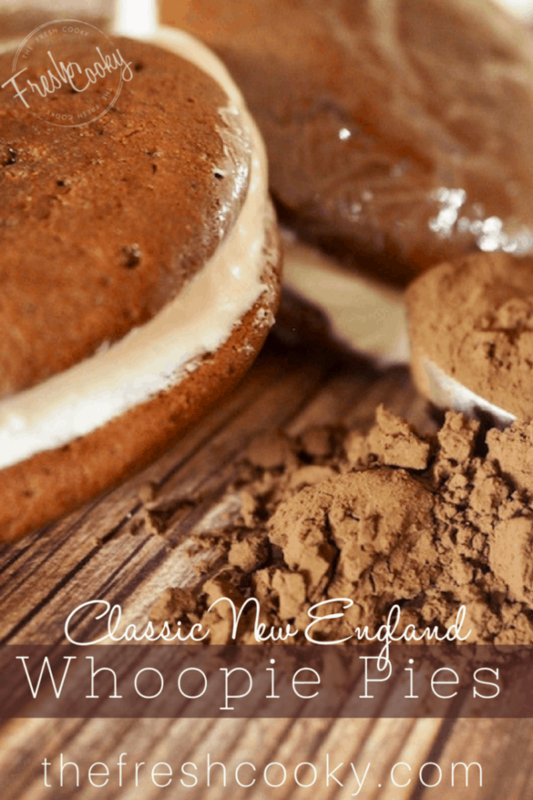 Class New England Whoopie Pies. Yummy, gooey, chocolatey, marshmallowy goodness, in a hand held pie! 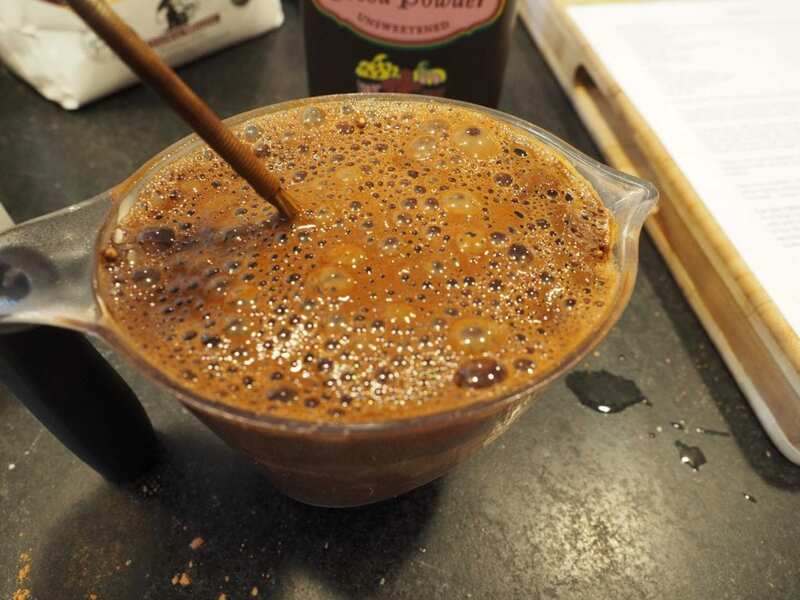 In a 2 cup or larger bowl or measuring cup, pour in hot water, stir in cocoa powder and baking soda with a fork until smooth; the mixture will foam up (a lot) and darken. Let the mixture stand until the foaming subsides and the mixture has cooled down. NOTE: you will be adding sour cream to this mixture after it cools. In a medium bowl, place flour, baking powder and salt, gently stir with whisk to mix. Set aside. 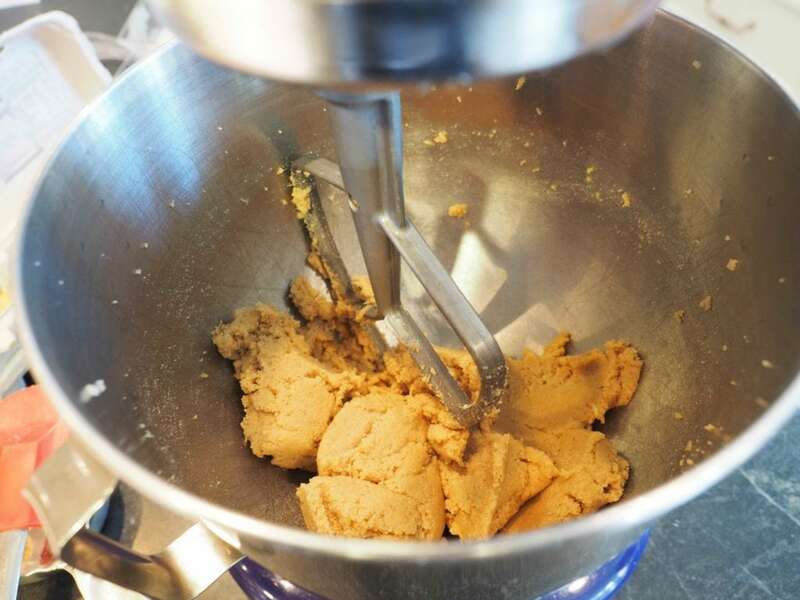 In a large bowl of an electric mixer, beat together the butter and brown sugar on medium-high until well blended and creamy, about 2 minutes. Scrape down sides of bowl. Add the egg and vanilla and beat until light and fluffy, about 2 more minutes, scraping sides often. Beat in half the flour mixture; scraping down the sides several times. Stir the sour cream into the cocoa mixture now cooled. 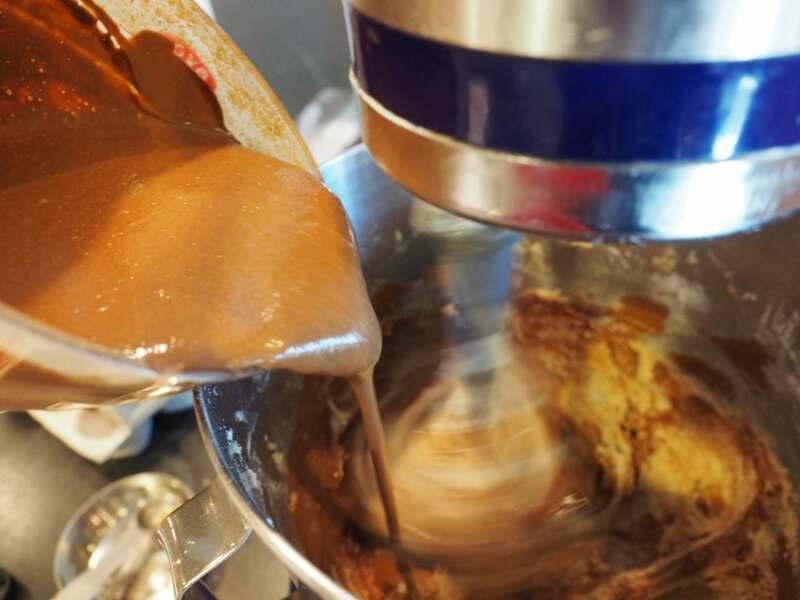 On low speed, beat the cocoa mixture and the remaining flour mixture, into the brown sugar mixture until even incorporated, Scraping down sides until you no longer see any of the white flour or creamed mixture. Using a medium to large scoop, drop the dough onto parchment lined baking sheets, spacing about 3 inches apart. 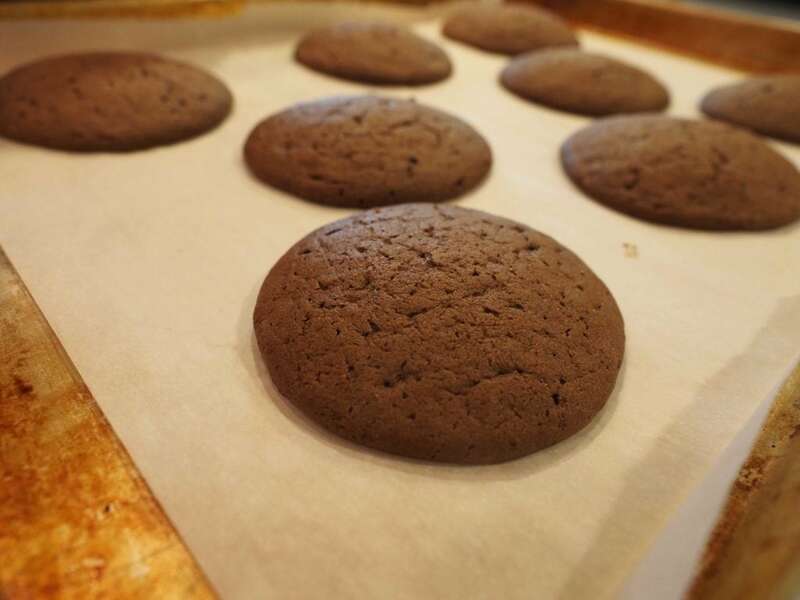 Don’t make the rounds much larger or they may spread too much during baking. You may make them smaller though. As these are a sandwich cookie, try and make an even number of cookies so they match up. Bake the cookies at 350, one sheet at a time, in the middle of the oven for about 10-12 minutes, or until they spring back when lightly pressed in the center. Transfer the sheet to a wire rack and let stand until cookies firm up, 4-5 minutes. Using spatula, transfer the cookies to wire racks. Let stand until completely cool. 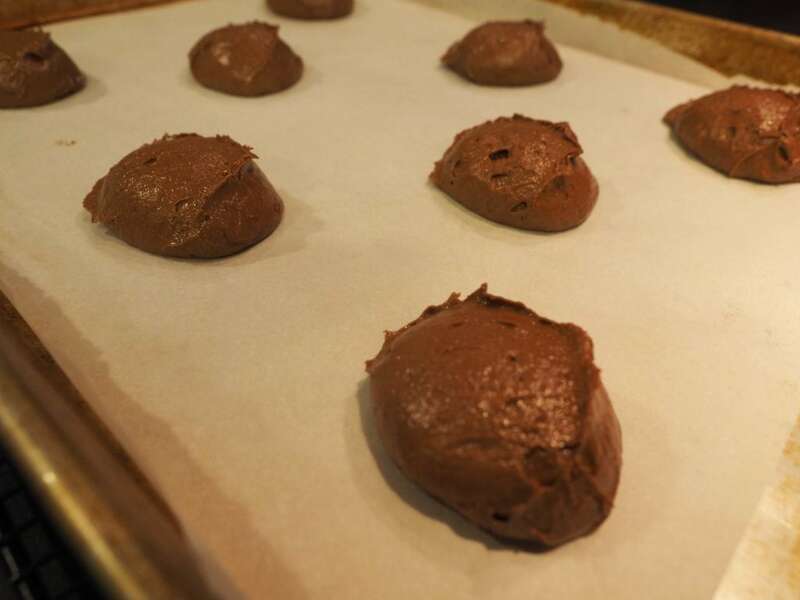 At this point after cooling, the cookies may be placed in freezer storage bags, layer using wax paper in between. Lay flat in the freezer. You may fill them straight from the freezer, sometimes easier. In the large bowl of a mixer, on medium speed, beat together the butter, powdered sugar, vanilla and salt until well blended and fluffy. Add the marshmallow cream and beat until evenly incorporated. Using a medium or large scoop, plop a generous portion of frosting onto “bottom” of cookie, leaving a ½ ” border around the edge. Top with matching cookie top. Pressing gently to sandwich them together, just until filling reaches edges. Store cookies in individual plastic bags or wrap in plastic wrap. Refrigerate or freeze (great to put in a lunch box) until ready to enjoy. 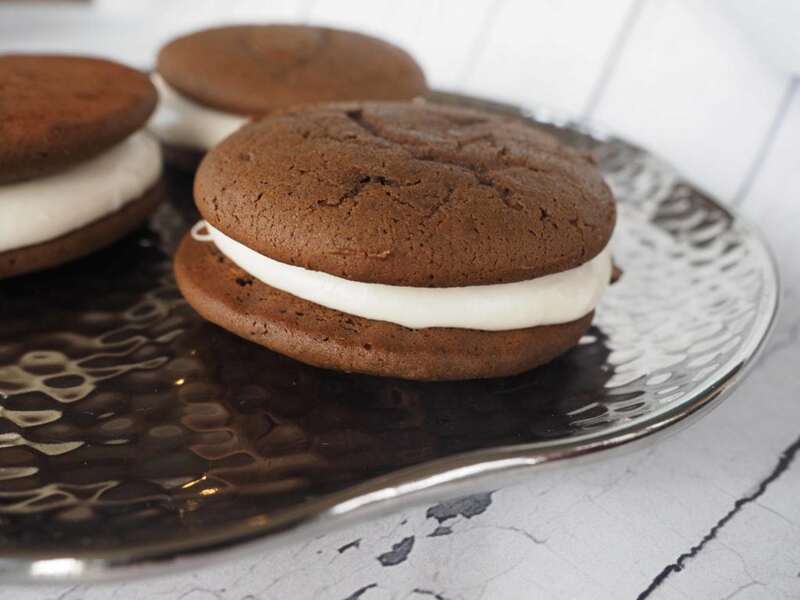 Copyright 2017 | This recipe for Whoopie Pies was featured first on The Fresh Cooky. Made these the other day! Fairly easy recipe and delicious. Thank Kathleen!! Thanks Dawn! Not hard just a bit time consuming.